Ontology-based data access (OBDA) is regarded as a key ingredient of the new generation of information systems. In the OBDA paradigm, an ontology defines a high-level global schema of (already existing) data sources and provides a vocabulary for user queries. An OBDA system rewrites such queries and ontologies into the vocabulary of the data sources and then delegates the actual query evaluation to a suitable query answering system such as a relational database management system or a datalog engine. 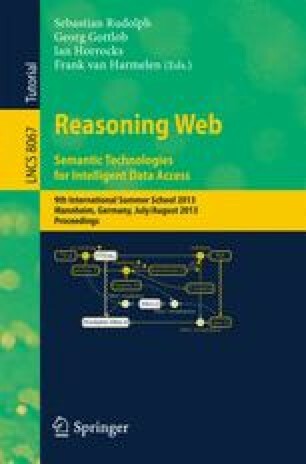 In this chapter, we mainly focus on OBDA with the ontology language OWL 2QL, one of the three profiles of the W3C standard Web Ontology Language OWL 2, and relational databases, although other possible languages will also be discussed. We consider different types of conjunctive query rewriting and their succinctness, different architectures of OBDA systems, and give an overview of the OBDA system Ontop. 1.Department of Computer Science and Information SystemsBirkbeck, University of LondonU.K.